You guys! Everyone who travels to Russia ends up falling in love with it. How can you not when it's such a beautiful country with so much to see and do and experience? Here is our ultimate Russia bucket list! 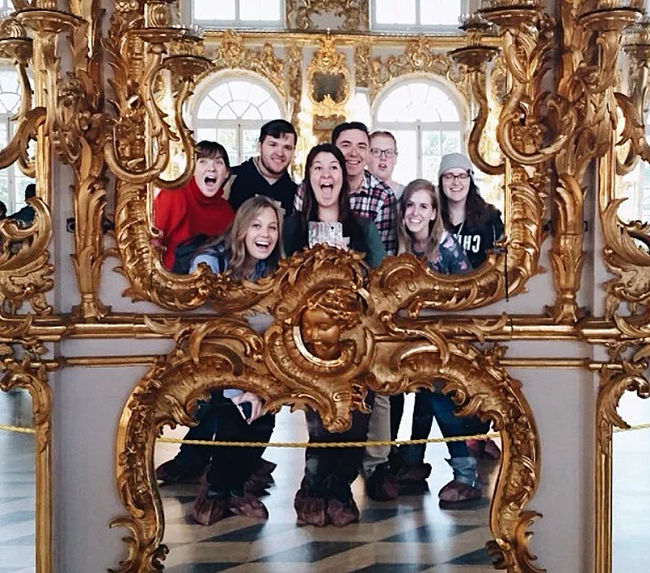 If you decide to be a volunteer with International Language Programs, you can actually live in Russia for an entire semester as an English teacher. An opportunity like this means you'll also have a lot of time to travel around Russia (and other places in Europe to) during your vacations + any weekend because you always have Saturday and Sunday off. We recommend spending an entire weekend just in St. Petersburg, and here's our complete guide to exploring it! 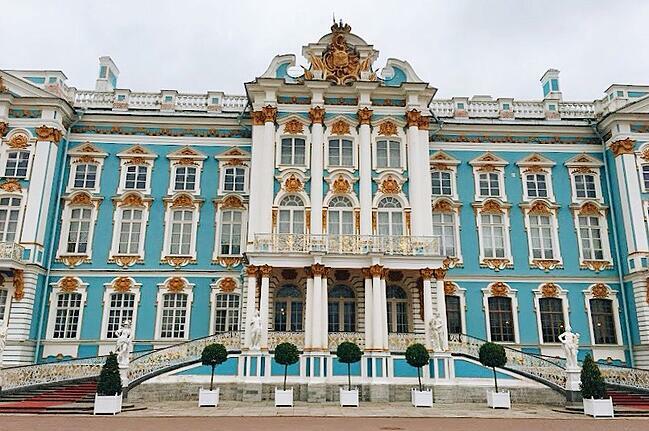 This palace is named after the wife of Peter the Great, Catherine I, who ruled Russia herself for two years after his death. But, it was their daughter, Elizabeth, who initiated the complete reconstruction of the original design to make it the stunning Versailles-like palace it is today. Over 200 lbs of gold were used to decorate just the exterior alone. At the end of WW II, the interior was completely destroyed by Nazi soldiers. Much of the artwork was also stolen or dismantled by them, including the entire Amber room, which at that time was said to be the 8th Wonder of the World. It has taken decades, millions of dollars, and many skilled craftsman to return this palace to its original grandeur. 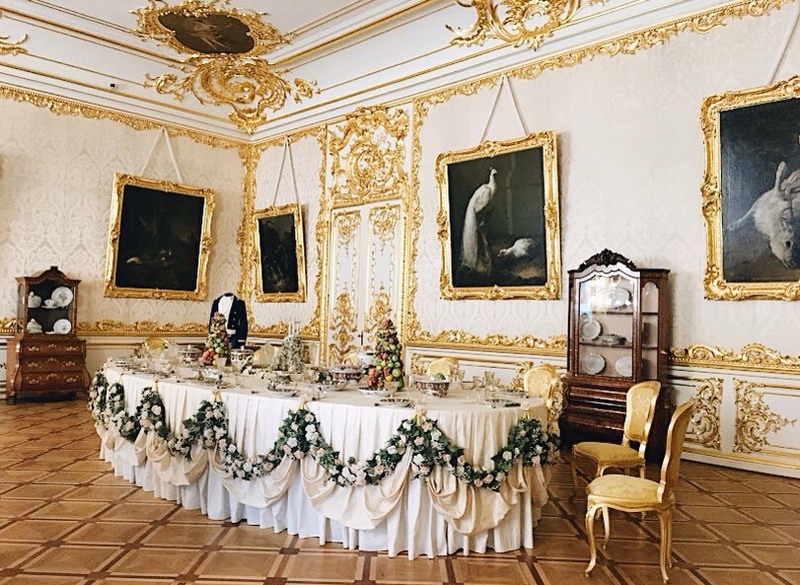 While the Hermitage in St. Petersburg is more of an art museum, this palace has been restored to look just as it did in the time of the tsars and their tsarinas. Get ready for a real walk through the past as you explore the rooms of one of the world's most phenomenal monuments of history and architecture. Located 25 kilometers south of St. Petersburg, this is a bit out of the way, but absolutely worth it if you have time. Especially if you won't get the chance to stop by The Palace of Versailles in Western Europe. The easiest way to get here is by starting from Vitebsky Railway Terminal in St Petersburg. From there you'll jump on the suburban train and get off at the Tsarskoe Selo (Pushkin) railway station. Then catch the bus #371 or #382, or even the minibus K-371, K-377, or K-382 and that will take you straight to Catherine's Palace and Park. Hours: Open Wednesday-Monday. Closed every Tuesday. Nov to Apr- 10 am to 4:45 pm. Jun to Aug- 12 pm to 6:45 pm. May & Sep- 12 pm to 5:45 pm. Oct to Nov 12 pm to 4:45. You can buy e-tickets online beforehand, but these vouchers are not equal to an actual entry ticket. And you can only purchase a maximum of four tickets with each booking. There are also very specific rules that you need to be aware of before purchasing them. First off, in order to exchange an e-ticket for an entry one, you do have to have proof of identity and a printed voucher. If you don't have it printed, you can state the number of your voucher that was included in your confirmation email. These tickets can be exchanged from 12 pm to 4 pm every day. During the winter season (October to April) you'll make this exchange at the ticket office No. 4 in the Main Vestibule of Catherine's Palace. During the summer season (May to September) you'll have to go to the ticket booth near the Church Gate. These entry tickets are only good for one hour after you receive them, so make sure you enter the palace before that hour has passed, otherwise you won't be able to get in. If you have any other questions about booking these tickets, or run into any problems, make sure you check their website's frequently asked questions page. These can be purchased in the Palace Vestibule. Tickets are about $11 (700 Rub) for adults, but if you remember to bring your ISIC or student ID card it will only be about $5 (350 Rub). Once you've purchased them, you do have to enter the palace within one hour. Every single room is breathtaking. The Golden Enfilade, a route on the tour, will take you through the Main Staircase (with ornate banisters and marble cupids), the Great Hall (also called the Hall of Light since it spans the width of the entire palace and is lined with large arched windows), the White Dining Room, the Portrait Hall, Chinese Blue Drawing Room (with painted silk wallpaper), the Cameron Rooms, the Green Dining Room, the Picture Gallery, and of course, the world-famous Amber Room. 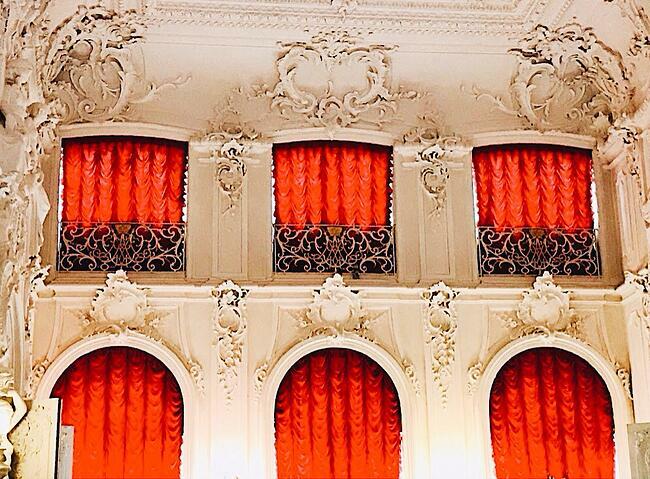 The Amber Room is the real gem of the palace, and once you step inside, you'll understand why. To create this exquisite chamber, panels of amber mosaic (totaling almost 1000 lbs of amber) were placed on the walls and surrounded with intricate carvings, mirrors, and mosaics of other gemstones. It was all dismantled by the Nazis during WW II, and where the original amber ended up is still unknown. In 1982, the 20-year-long and $12,000,000 project of recreating this room was begun. It is now open to the public, and since no pictures can be taken inside of it, you have to soak up every second you're in this room. Make sure you also have plenty of time to walk around the extensive and lavish gardens outside of the palace. You'll leave even more wonderstruck by the history of the tsars and their tsarinas who loved all things grandeur. Want to talk with someone who has actually lived in Russia as a volunteer? their experiences of volunteering and traveling all around the world. Click the button below to ask them any questions you have!